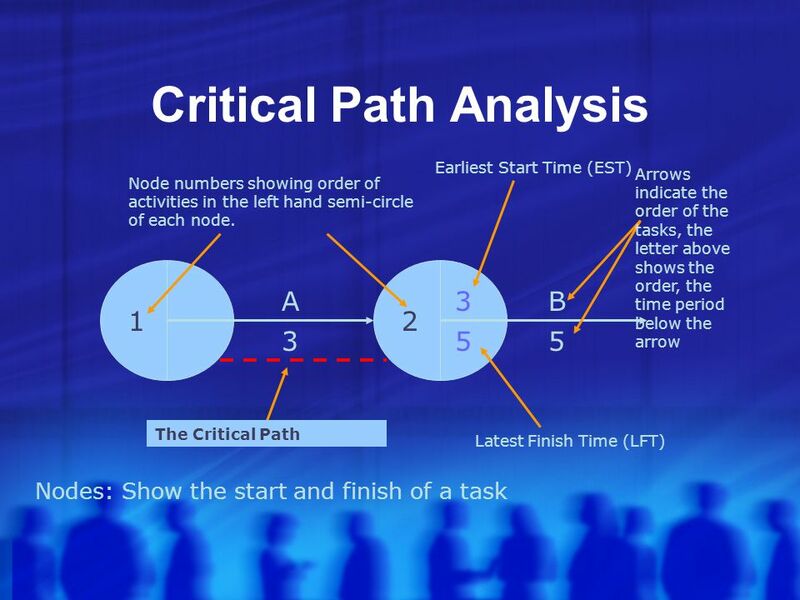 Project Management Techniques and tools Move mouse over arrow to enter presentation. 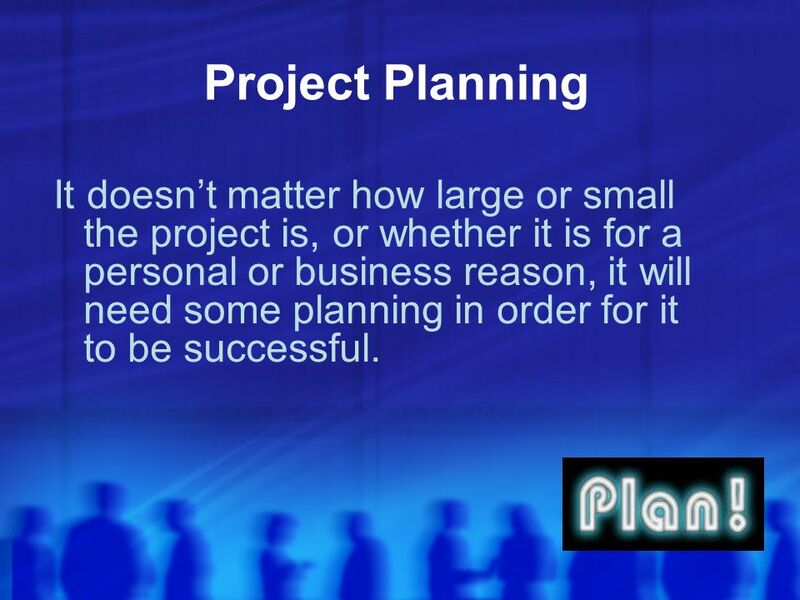 5 Project Planning It doesnt matter how large or small the project is, or whether it is for a personal or business reason, it will need some planning in order for it to be successful. 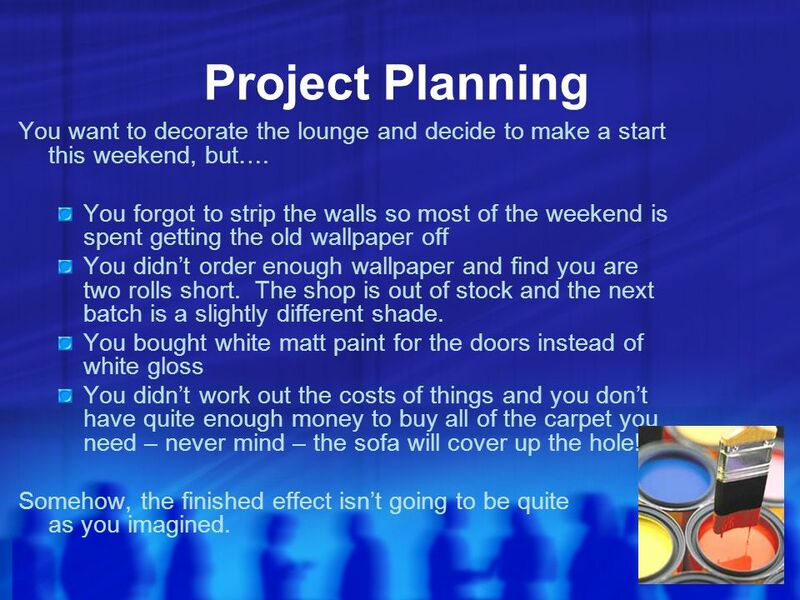 7 Project Planning You want to decorate the lounge and decide to make a start this weekend, but…. You forgot to strip the walls so most of the weekend is spent getting the old wallpaper off You didnt order enough wallpaper and find you are two rolls short. The shop is out of stock and the next batch is a slightly different shade. You bought white matt paint for the doors instead of white gloss You didnt work out the costs of things and you dont have quite enough money to buy all of the carpet you need – never mind – the sofa will cover up the hole! Somehow, the finished effect isnt going to be quite as you imagined. 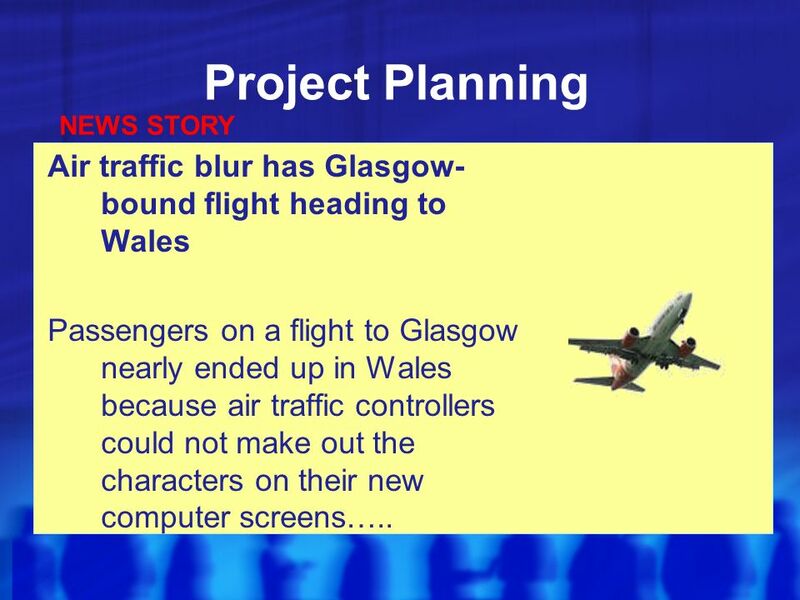 12 Project Planning The examples given were from real news stories about some major IT projects which have gone horribly wrong. Mistakes can be very expensive, they can even lead to bankruptcy or as you just saw, a potential disaster. 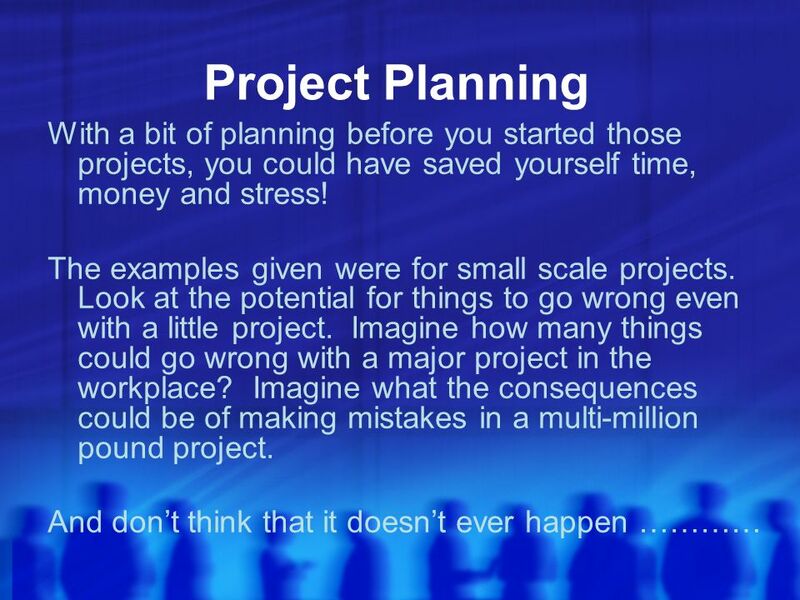 The key to any successful project, no matter who it is for, no matter what the cost or value, is PLANNING. 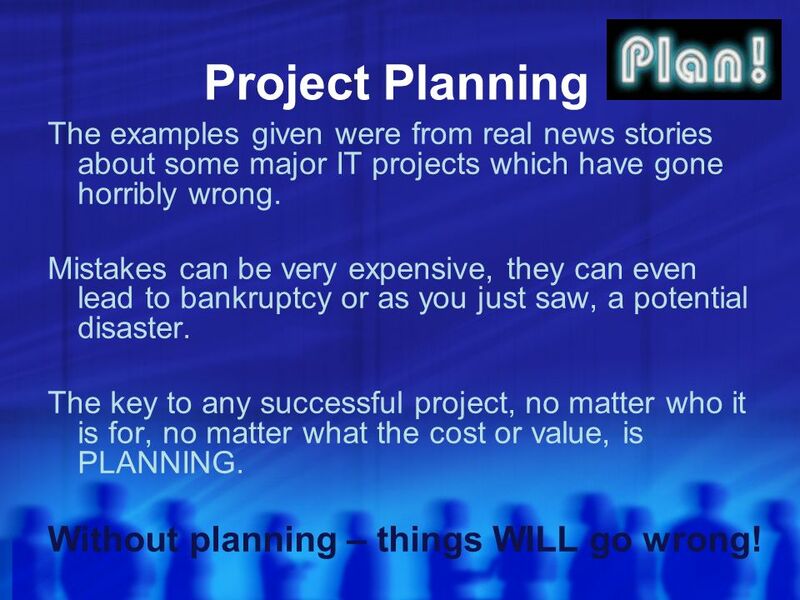 Without planning – things WILL go wrong! 14 Budget It may be that extra budget has to be allocated or costs need to be cut back. 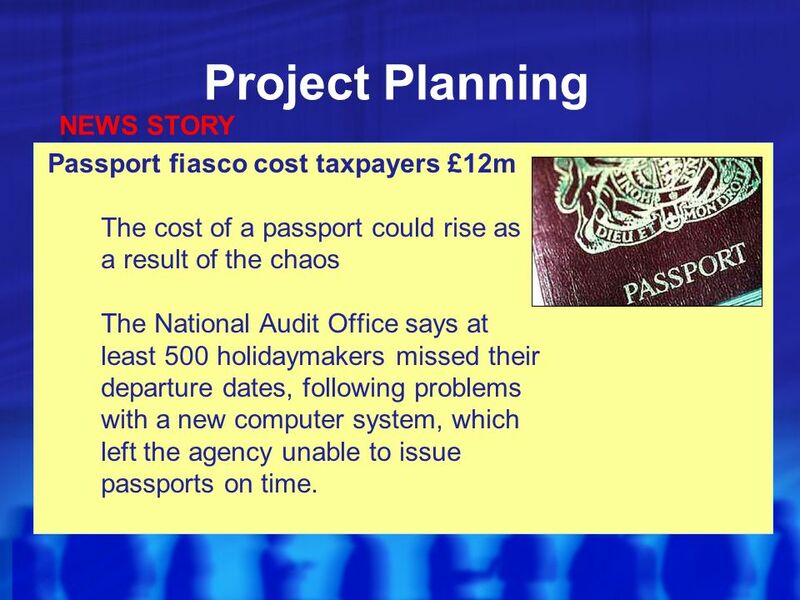 All projects should have a fixed budget set right at the outset. 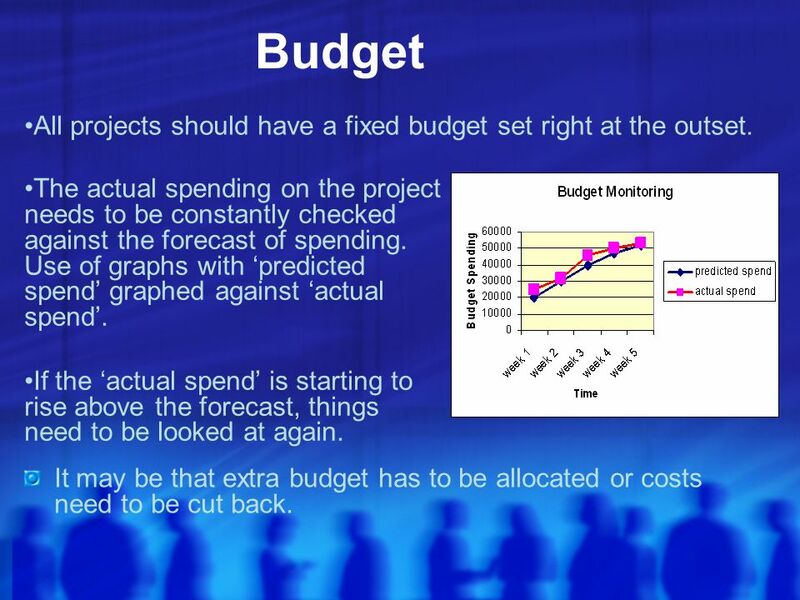 The actual spending on the project needs to be constantly checked against the forecast of spending. 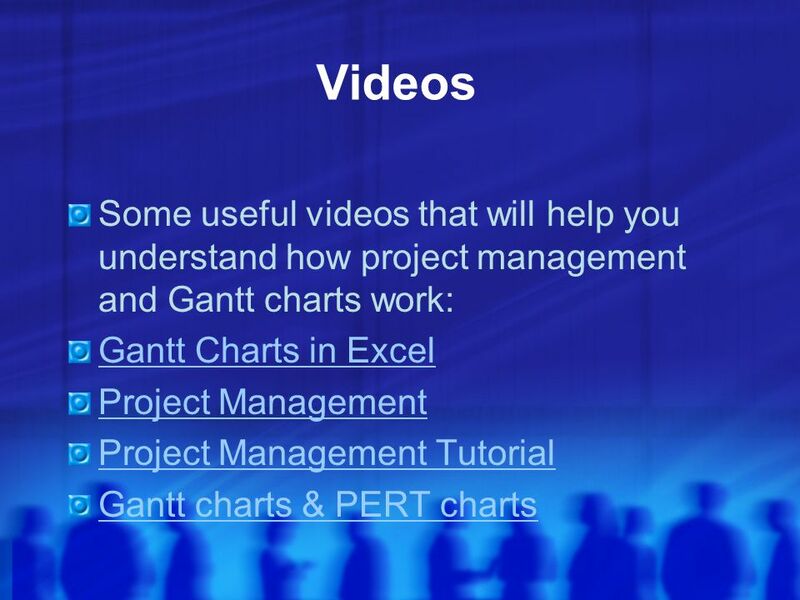 Use of graphs with predicted spend graphed against actual spend. If the actual spend is starting to rise above the forecast, things need to be looked at again. 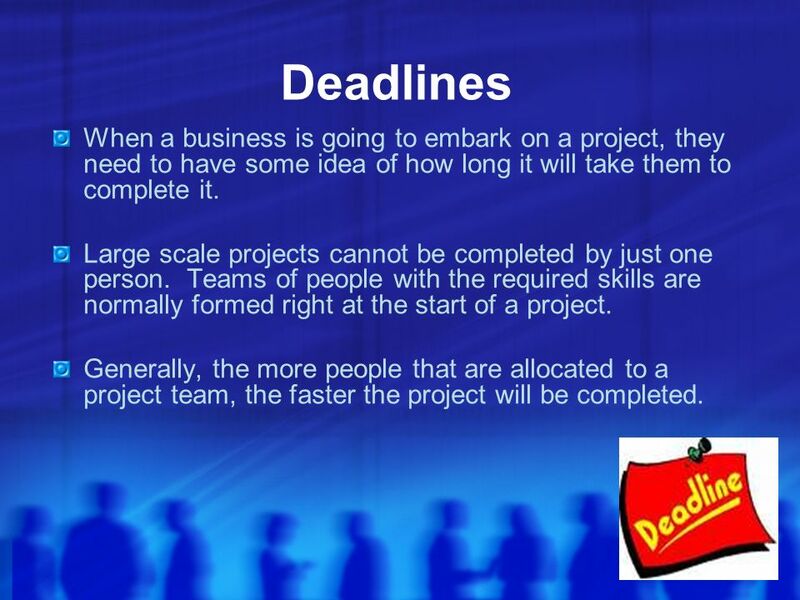 15 Deadlines When a business is going to embark on a project, they need to have some idea of how long it will take them to complete it. 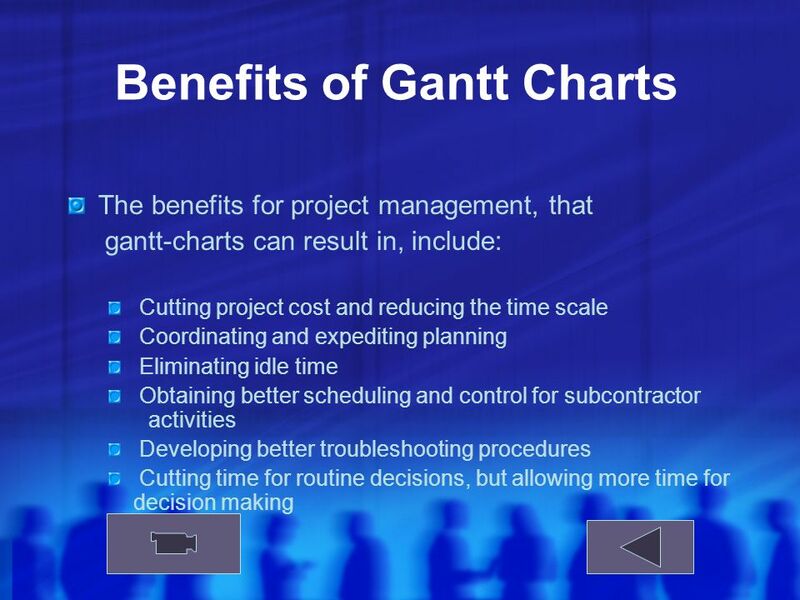 Large scale projects cannot be completed by just one person. 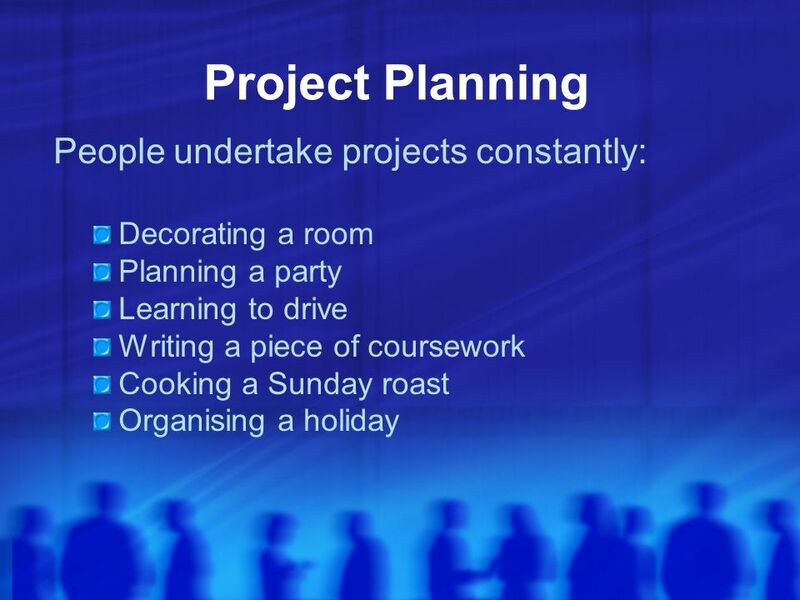 Teams of people with the required skills are normally formed right at the start of a project. 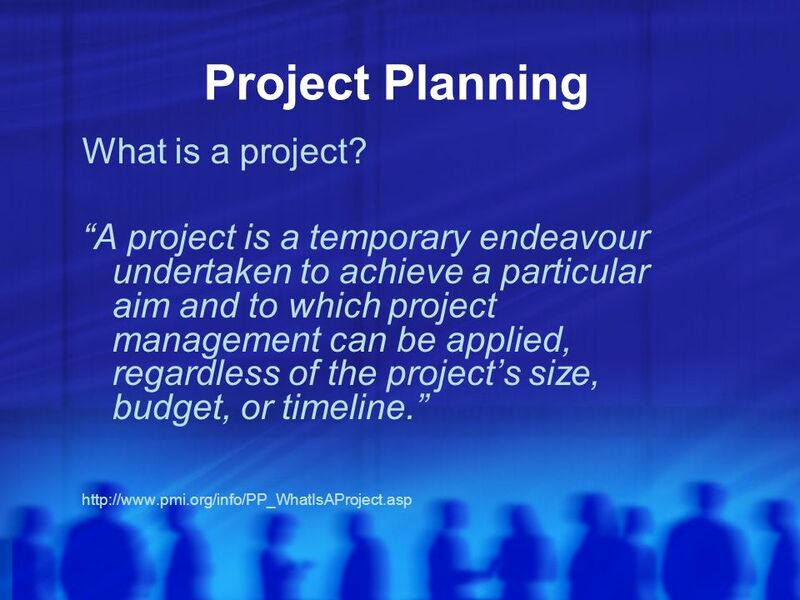 Generally, the more people that are allocated to a project team, the faster the project will be completed. 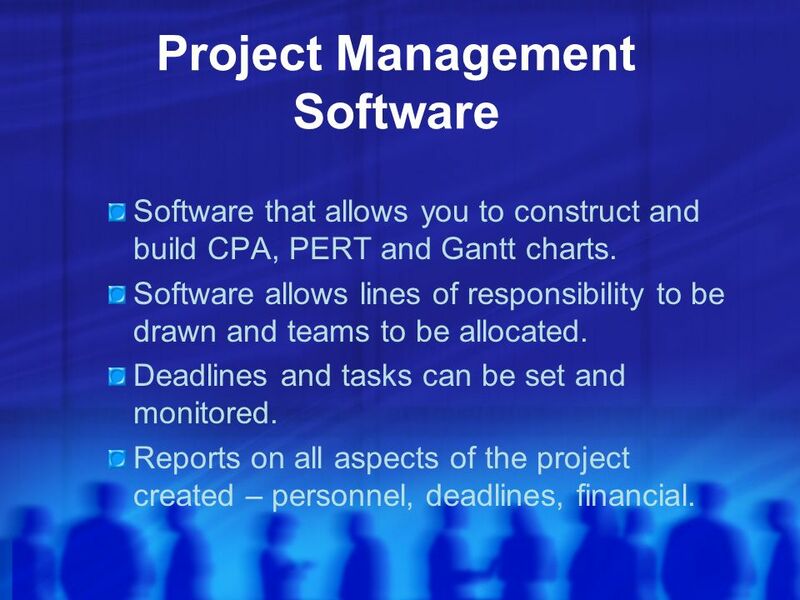 19 Project Management Software Software that allows you to construct and build CPA, PERT and Gantt charts. 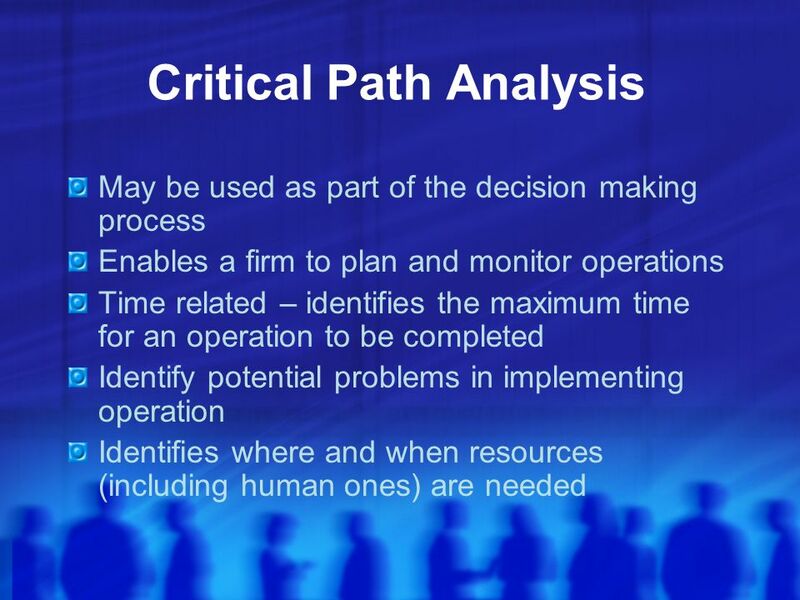 Software allows lines of responsibility to be drawn and teams to be allocated. 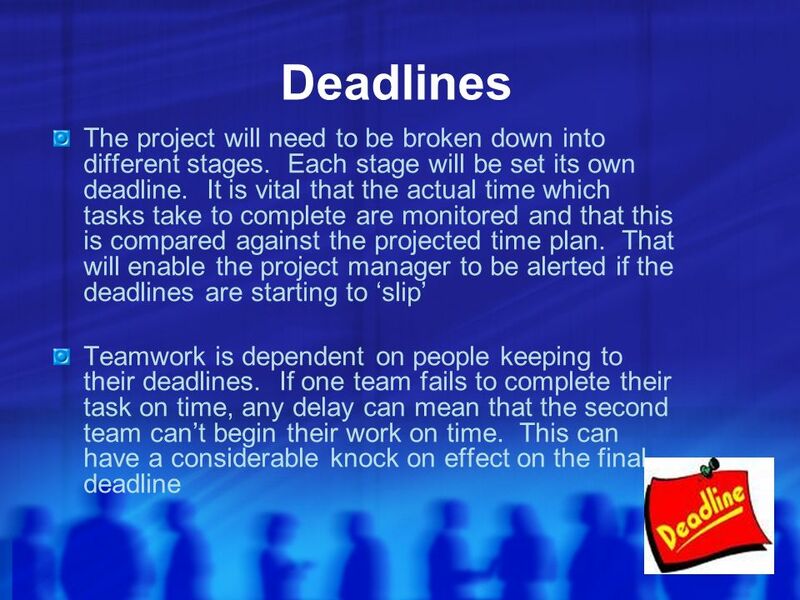 Deadlines and tasks can be set and monitored. 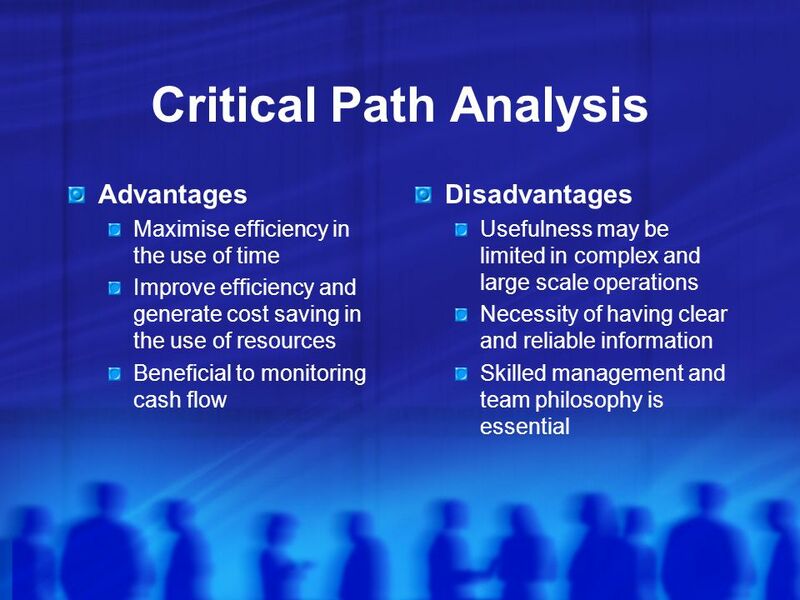 Reports on all aspects of the project created – personnel, deadlines, financial. 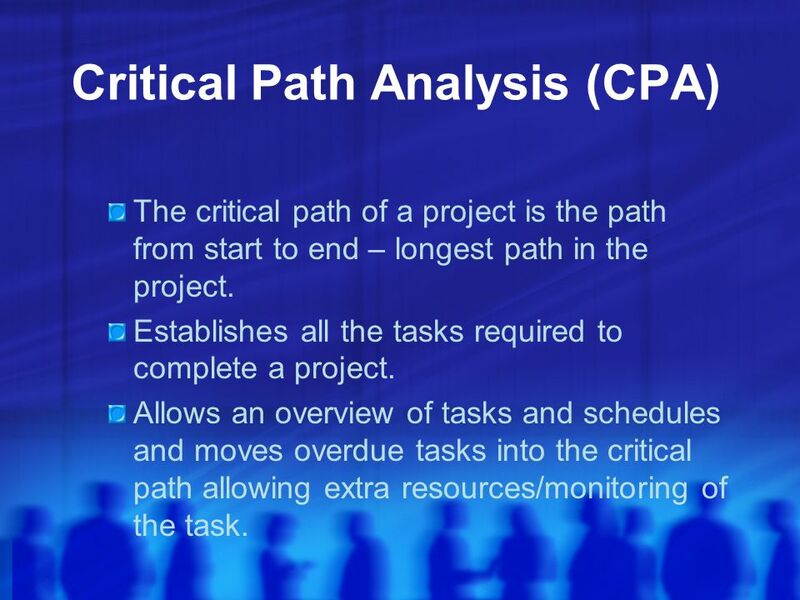 20 Critical Path Analysis (CPA) The critical path of a project is the path from start to end – longest path in the project. 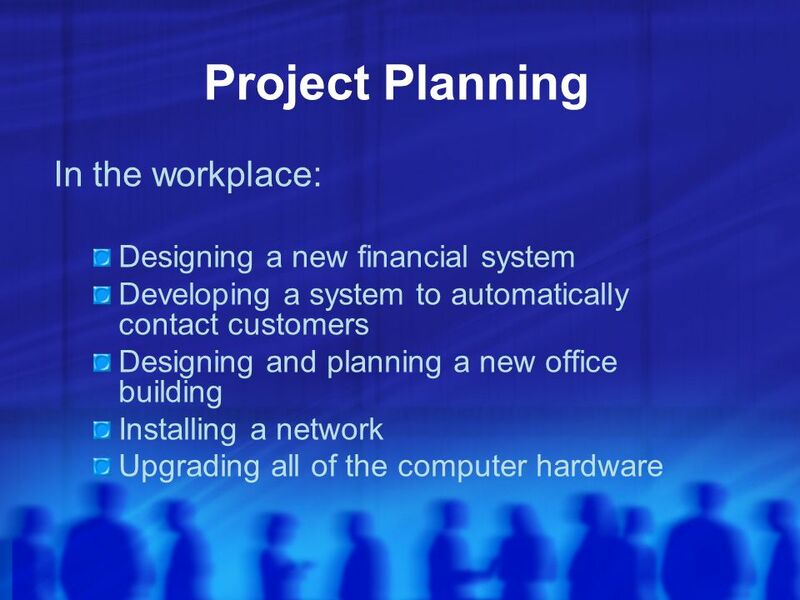 Establishes all the tasks required to complete a project. 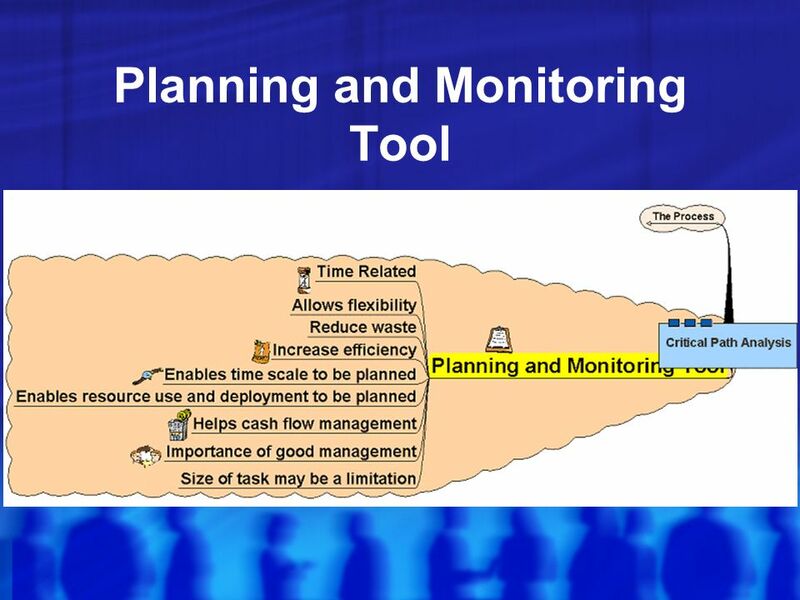 Allows an overview of tasks and schedules and moves overdue tasks into the critical path allowing extra resources/monitoring of the task. 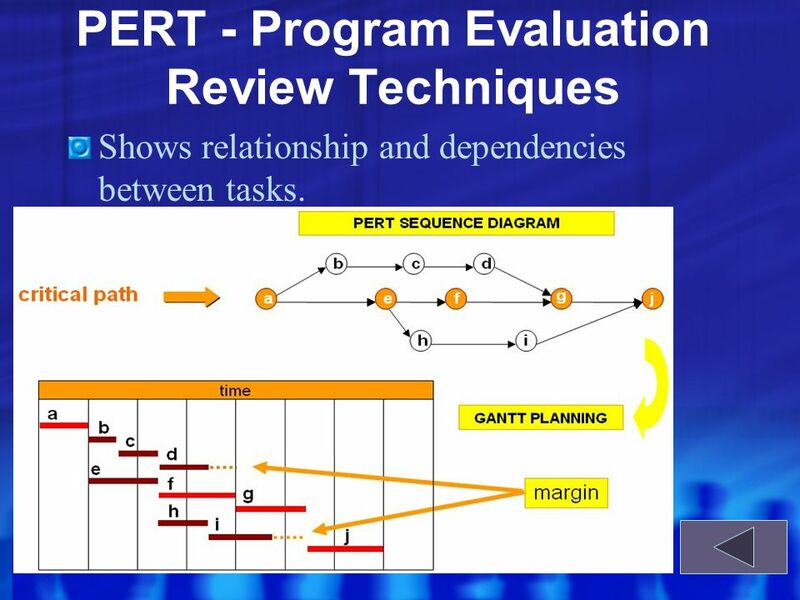 30 PERT - Program Evaluation Review Techniques Shows relationship and dependencies between tasks. 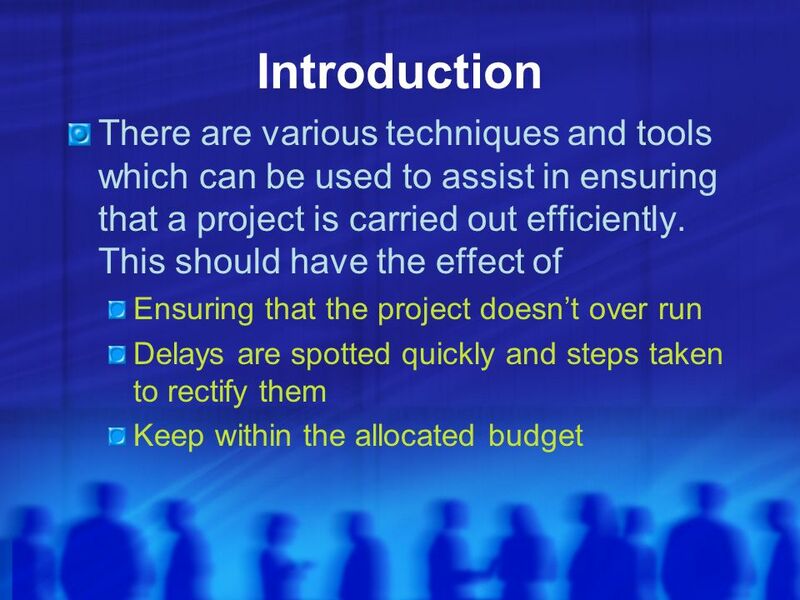 Download ppt "Project Management Techniques and tools Move mouse over arrow to enter presentation." 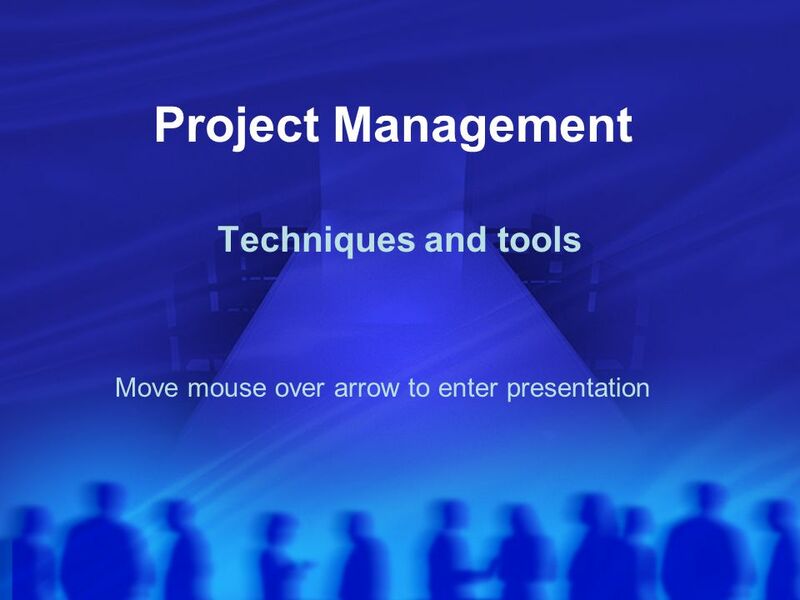 Project Management Techniques and tools Move mouse over arrow to enter presentation End Show. 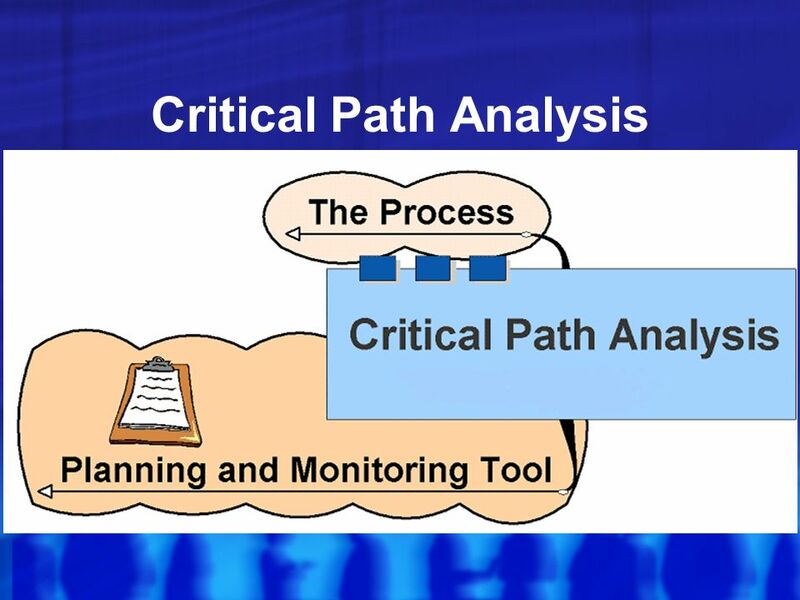 Copyright 2006 – Biz/ed Critical Path Analysis. 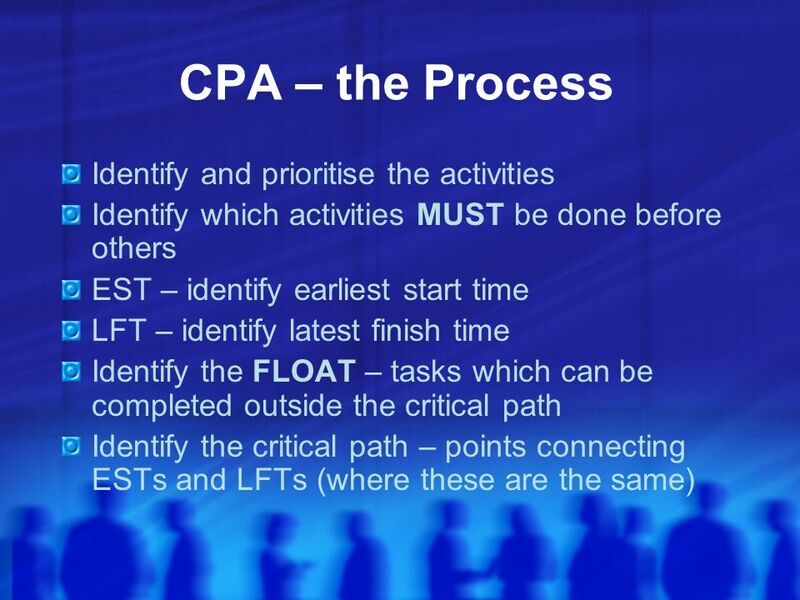  Chapter 6: Activity Planning – Part 1 NET481: Project Management Afnan Albahli. 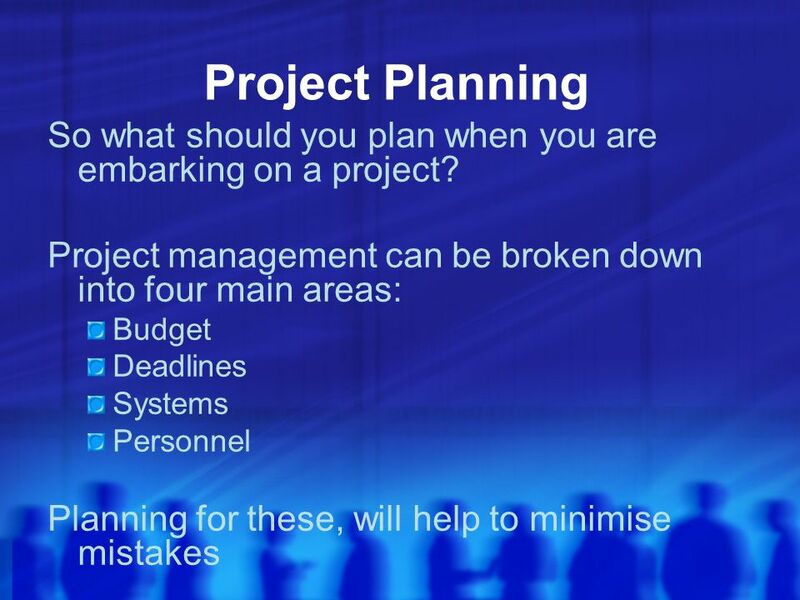 Planning and Managing your Research Project Dr Keith Morgan. 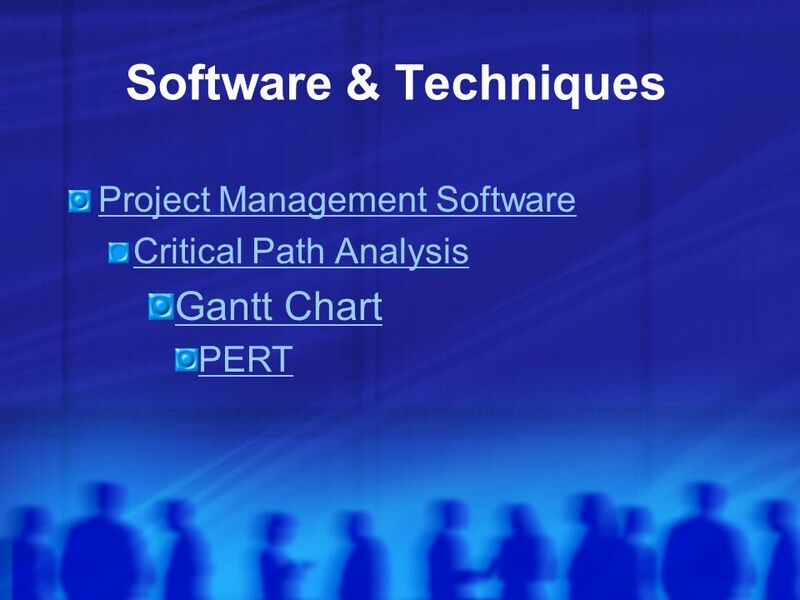 PROJECT MANAGEMENT CPM/PERT V P B Chakravarthi. K Abhijeet Kumar. 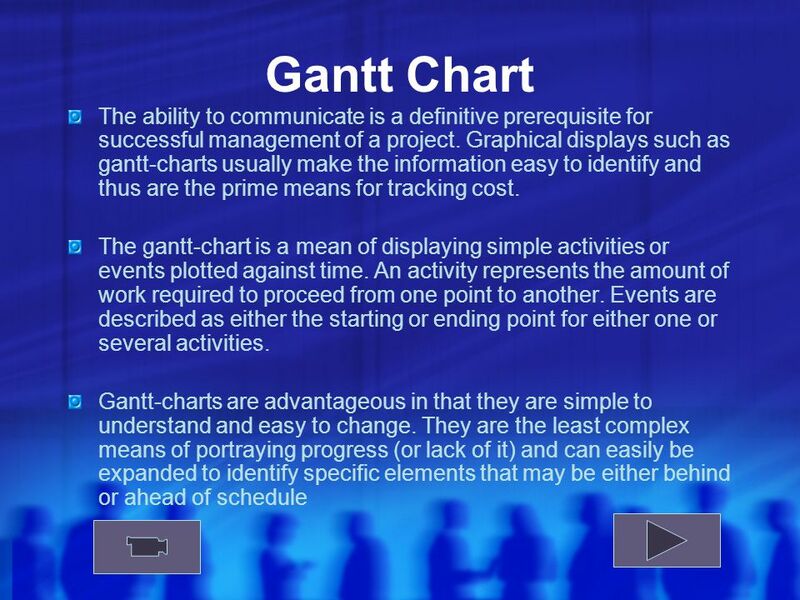 Having Fun with Gantt PERT &. 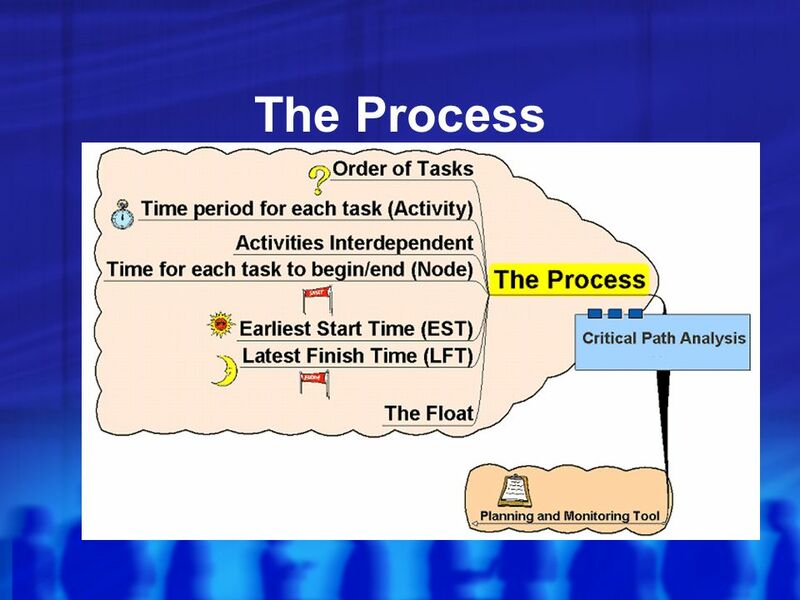 CS3500 Software Engineering Project Management (1) In 1986 one well-known software engineer (Tom DeMarco) made the simple but important observation: “You. 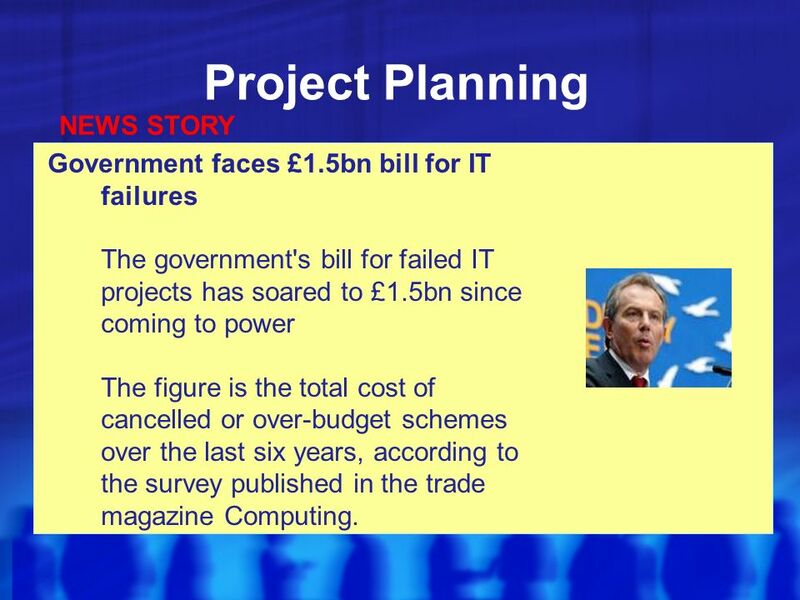 5.8 Project Management Chapter 37 HL - Only. 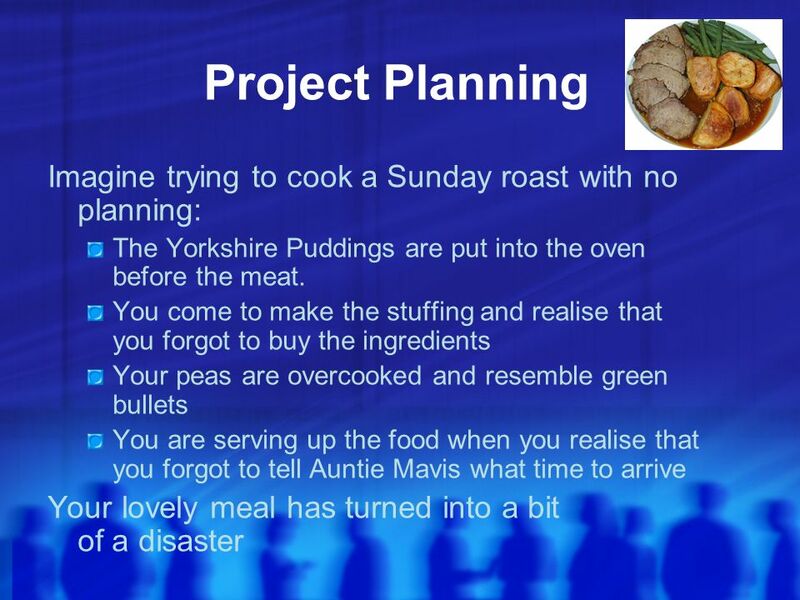 Planning & Scheduling Systems: From Design to Fabrication. Introduction to YNAB Start living a richer life... Live Classes Online © YouNeedABudget.com. All Rights Reserved. 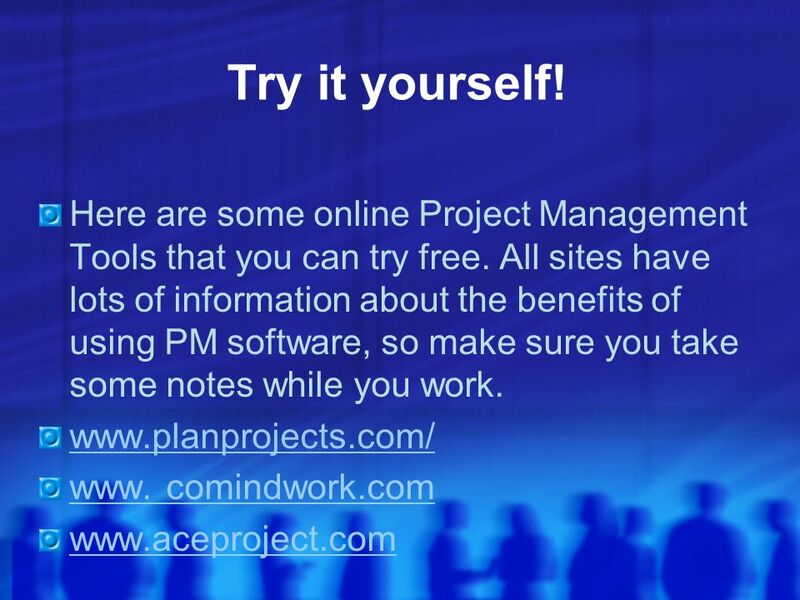 Project management A whistle-stop tour Toot!. Places to see Overview Project design in detail Task analysis example Design documentation examples Terminus.